Microsoft Outlook 2016 has a new feature which the company highlighted when it first appeared, which is that it sends attachments as links by default, if they are stored in network-accessible locations. The idea is to prevent proliferation of different versions if several respondents make changes and email them back. It also means that everyone has the latest version. Good stuff, right? 1. Hmm, shall I send the minutes of our last meeting to this person at supplier X? Better check there is nothing sensitive in it. [Checks]. OK, send. 2. Colleague happens to look at minutes, thinks, why did we not minute our difficulties with supplier X? Adds section of sensitive information and proposal to switch to supplier Y.
OK, my scenario is somewhat contrived, but you can see the underlying issue. There is also the question of whether the mechanism behind this feature is really robust. It is not in fact a simple feature. 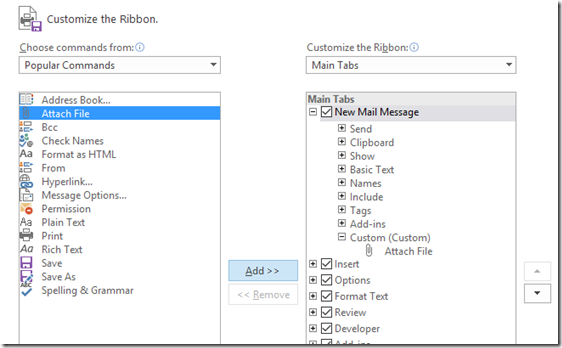 What is meant to happen is that Outlook detects whether your document can be sent as a link, and if it can, interacts with SharePoint to create a magic link with either view or edit permissions. In my experience, it is easy to end up sending an attachment that cannot in fact be accessed by the person at the other end. 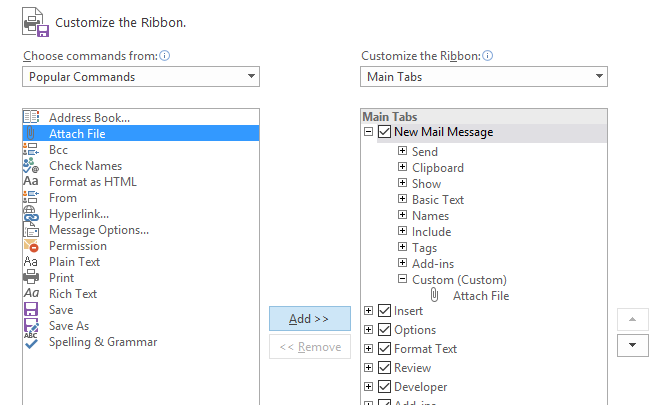 I have an internal SharePoint and soon figured out that I had to prevent Outlook from sending documents as links. The URL I use for SharePoint internally is not accessible externally, which is perhaps a flaw in my setup, but not one that has ever caused problems before. In any case, I would prefer not to give out any magic links to documents in my SharePoint; it just seems an unnecessary security risk. 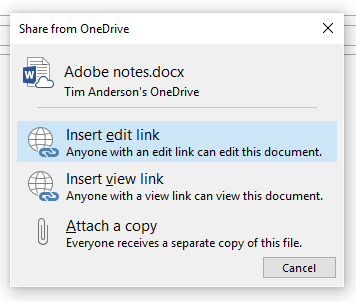 In the case of Office 365, note that external sharing may be switched off, in which case links will not work. External sharing may also be disabled for specific sites. Maybe Outlook 2016 is smart enough to detect whether or not external sharing is enabled, but if so, this does seem to go wrong sometimes. 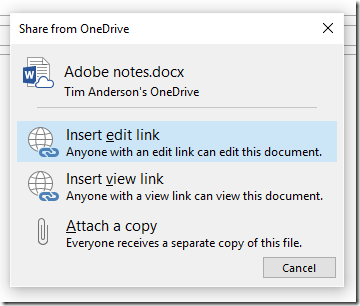 I have seen cases where users send an attachment link, but the recipient cannot access the document. Rather, they click the link and get a “can’t be found in directory” error or similar. Note the little icon, an embedded image, which includes a cloud to give you a clue that this is not really attached. It also seems to mess up text formatting; note that my typing is now Times New Roman rather than Calibri. Another Outlook mystery. So how do you prevent this behaviour? 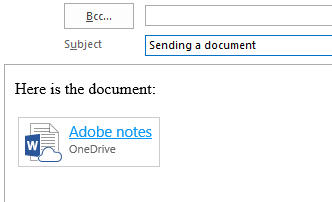 Given the difficulties it can cause, I thought Outlook might have an option to disable sending attachments as links, or at least to prevent it happening by default. I have not found such an option yet. 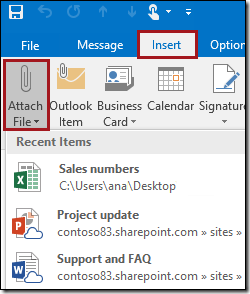 One point to bear in mind is that in previous versions of Outlook it was not easy to send a document from SharePoint at all, unless you could access it from Windows Explorer. This means using WebDAV (“Open in Explorer”), or the still-problematic OneDrive for Business client. 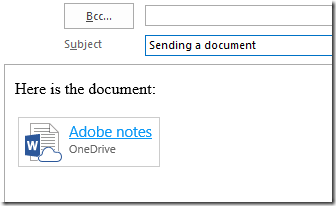 So the dropdown with recently accessed SharePoint and OneDrive documents is new and potentially welcome functionality. My custom Attach File is on the right in the image above, does not have a drop-down list, and simply selects a file using an insert file dialog. I appreciate that these are workarounds and not complete solutions. Did Microsoft really think through this feature? Why the bugs? Why no easy way to disable it? I wish I knew.